Rent a nice vehicle. Enjoy the trip, I mean the fall. There is a lot of stress going on in this world (most of mine caused by myself) and a lot of ways that people deal with it. Some people like to workout (why again?) others like to use something called retail therapy (whatever the crap that is) and still other like to write. The last and most extreme option is vacation. When you finally jump through all the hula hoops, and sign the waver claiming that you will do twice the work when you get back plus the work of everyone else that takes a vacation when you get back, then you can finally get those precious days off. When most people take days off, they take full advantage by going places, planning fun outings, or being productive and getting things done that they couldn’t do while working. Not me. Plan poorly. I like to make sure that every moment of my vacation is completely unplanned. Would it be fun to go to a matinee that I would never be able to while at work? Let me waste time thinking about it but not doing it until it is 6:00 and too late for a matinee. Would it be fun to do an all day trip to a water park? Let me waste the three sunny days talking about it, until it rains the last three days and only get to go for two hours until the rain waters out the water park. Do things you would normally do if you were working. Go to doctor’s appointments, grocery shopping, watch TV. Make sure that by the time you would normally leave work, you haven’t done something exciting or productive. Go places that you would normally go. Like the moon. Hope your home is there when you get back. Make sure your vacation needs plenty of recovery time. Family time. Make sure your family knows that it was so valuable to have you home. Kids should be excited to have you home for about 5-10 minutes into your vacation, but should want to be ready to ship you off to work by your first real day of vacation. Once you start assigning them to do homework, or making them your personal valet service, they will be itching your scratch you to work. Mom should notice how great it is to have someone else at home to do stuff, until she just realizes how many more dishes seem to be piling up while you are here. Or how the seat she is used to sitting seems to always be full. While wasting valuable time at work is a valuable skill, only the truly bitter can wast valuable vacation time. Good luck making your vacation a true waste of time. By the way, if you all want the Bitter Advice Thursday to be a regular thing, go ahead and leave a bitter question that you want answered. No pressure on getting one out. Cause that is only tomorrow. Like less that 24 hours. I’m off to waste yet another valuable vacation day. It’s one thing not to do anything on your vacation that involves movement, but any ideas on where one can work, get paid a living wage (i.e. more than minimum wage) and not actually work? Because you aren’t as bitter as I am. You try hard, but no one can beat the bitterness that comes so naturally to me. Thanks for giving up so easily. Makes my Bitter Masterness seems so much bitter. Oh Ben – you crack me UP! 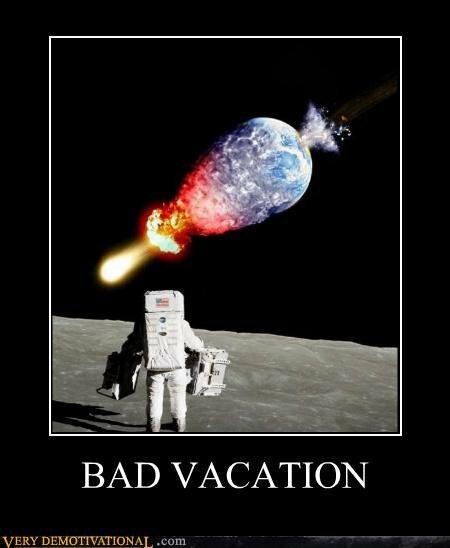 I hope you’re having a great unproductive vacation! I always do. And I hope you vacation is not bitter like mine always seem to be. I guess your browser is bitter about coming to my site. I don’t blame it. That makes me bitter. I just want people to be able to read all my posts. Perhaps I should call AOL and tell them to stop screwing with my blog. They put me on hold and the fax noise came through. But now it’s Friday but it’s only breakfast. Four more hoursssss…. And I haven’t had pizza. Now I’m so glad that I had spend all my vacation budget for something different! I would buy yourself a new couch and plant yourself there. I’m planning a vacation and have no where I can go without spending money and valuable energy. Besides the usual sitting at home, going to dr, etc, what do you suggest? I would suggest you read the newspaper take in the local sights. Things like the local dump, dirt bike track, or local farm. Horse around there. I hope you’re not contagious! You bitter believe I’m contagious. Anytime I sneeze in someone’s face, they get bitter for some reason. Initially, I read Matinee as Manatee…& I was really impressed that you even thought to go see a Manatee on your vacation…because, I’d never come up with that sort of stellar idea. 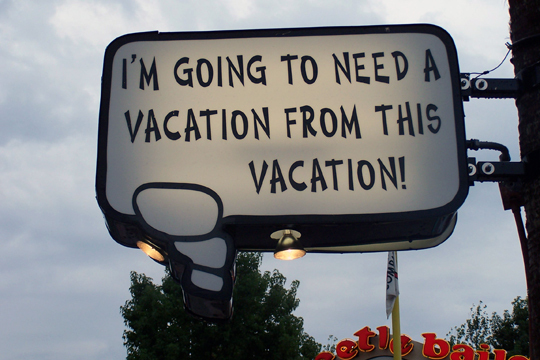 Go take a nap & enjoy your unproductive vacation! Manatee’s are actually hero’s of mine. As far as the sea goes, they are some of the laziest and bitterest. Because how would you like to be called a sea cow? Yeah, like people that like to call me a land cow. I am doing my best to being unproductive and failing. ARRRRGGGGH! I had a fight with my neighbor because her bratty rotten kid was mean to my kid. Now the neighbors seem to be doing anything they can to avoid seeing us, which fills my heart with delight, no to mention that I don’t have to look at her bratty kids anymore. I do, however feel bad for my kid. I am afraid she will end up with no friends like her bitter mom. What should I do? You should tell her that her bratty kid should go play in a ditch, then if she ever asks you say that you told her not to play in a ditch, but she would listen to you, just like she doesn’t listen to her and maybe she should teach her to child to listen. I know this response was written as somewhat tongue in cheek, but believe me when I say, that wasn’t far off of what actually happened! I’m glad to see that bitterness was there to solve your problems. And that I am good at predicting what you do. I hope you enjoy your bitter battle with your neighbor!